"'The Renewable City' by Peter Droege is a very timely book and one that should have a big impact on world cities." "Fantastic stuff. Inspires me to keep going." " ... 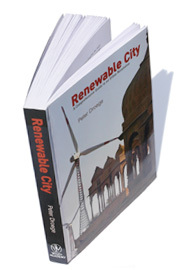 The power of this book is that it provides a good sketch of the new city: The Renewable City. The city is critically important in the post-fossil age because solutions will tend to be at a smaller scale ... In the near future every consumer will also be able to produce energy — sustainably — from the sun, wind, waste, biomass and the like: everybody as prosumer is linked in a virtual power plant. The city becomes a renewable energy source. ... 'Renewable City' is a good book for the sharpening of the sustainable urban development debate. It also delivers a multitude of facts in compact form ..."
"... received from Amazon your Renewable City. I ... was so enthusiastic about it that I am going to propose it to my publisher for the Italian version of it." "This book is a magnificent resource for students, practitioners and concerned citizens. It belongs on one’s desk as a constant reference source and, in these times, not on the shelves ... The author combines an encyclopaedic knowledge with a lucid writing style that places this book in the Meadows, Carsons and Lovins class as one who can turn around mindsets but also provide a vision ahead." "Having read many books on the subject of ecological building and sustainable development, it is a refreshing change to read this book." "This book asks the relevant questions for today's urban and regional planning and is a rich resource for answers." "I really love your book 'Renewable City'. The subject matter really hits the core of my interest in urban design and city planning. Thanks for the inspiration!"